Introduction I wanted to do something to connect the Microview to the real world, so this project begins a short series to display GPS data on the Microview. All we will do here is connect a GPS unit and show some of the data it is sending. Next, we will interpret that data into GPS co-ordinates. A couple of weeks ago my Zero ran flat within a few miles reaching the ‘reserve’ level, with two bars flashing. This was unexpected as I had thought it would have at least 20 miles left in the tank, so to speak. It was raining heavily at the time so it may have been due to water ingress somewhere, perhaps above the battery. It seemed a good idea to get on with some more waterproofing. So this blog is about my attempt to stop water splashing up into the fusebox area from the front wheel. The MicroView has a dial-type gauge that can be implemented in two styles – larger and smaller. 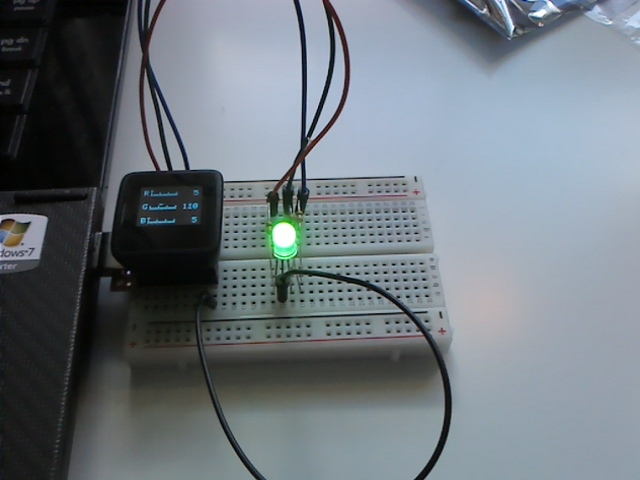 This project is an adaptation of Project 003 which also used a potentiometer to demonstrate the MicroView sliders. It’s possible to draw multiple components of different kinds on the MicroView screen at once. In this blog, the three inputs to an RGB LED are controlled using pulse width modulation (PWM) signals. The three sliders are set up with simple labels ‘R’, ‘G’ or ‘B’ to the left. Each colour is raised to full brightness, then dimmed in sequence. 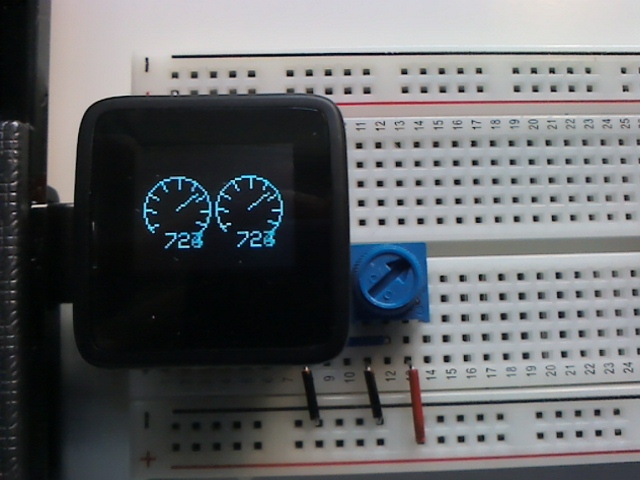 The sliders show this graphically and display the current PWM value from 0-256 in real time. 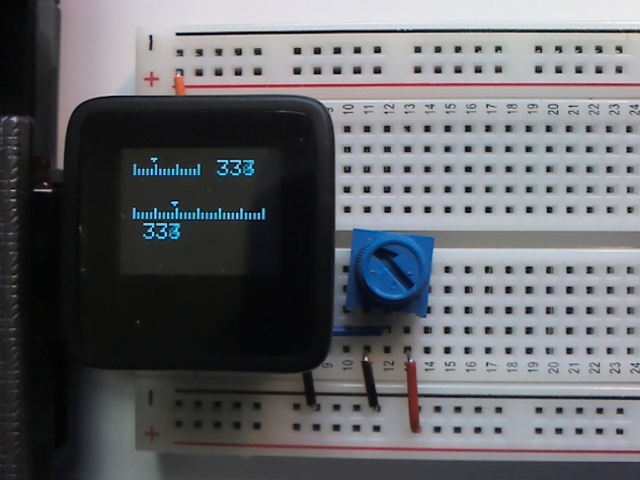 Pins referenced in code as 3, 5 and 6 (numerical pins 12 to 14) are capable of PWM on the MicroView. These are connected to the LED via 330 ohm resistors in the usual way, with the COMMON of the LED connected to pin 8 (GND). The slider is positioned above the readout. The sliders can be positioned anywhere on the display and both the minimum and maximum values displayed can be specified. (* note below). I have just received the MicroView Education kit, the result of a Kickstarter project by the team at Geek Ammo and I’m pretty impressed. 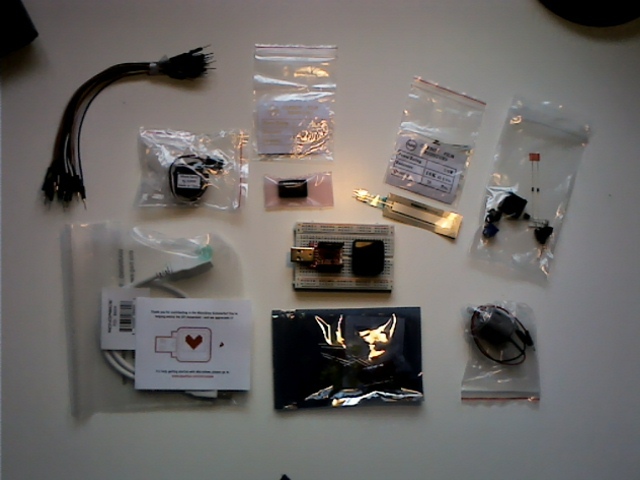 The hardware is distributed by Sparkfun and essentially comprises the MicroView with the accessories normally included in the (Arduino) Sparkfun Inventors Kit. 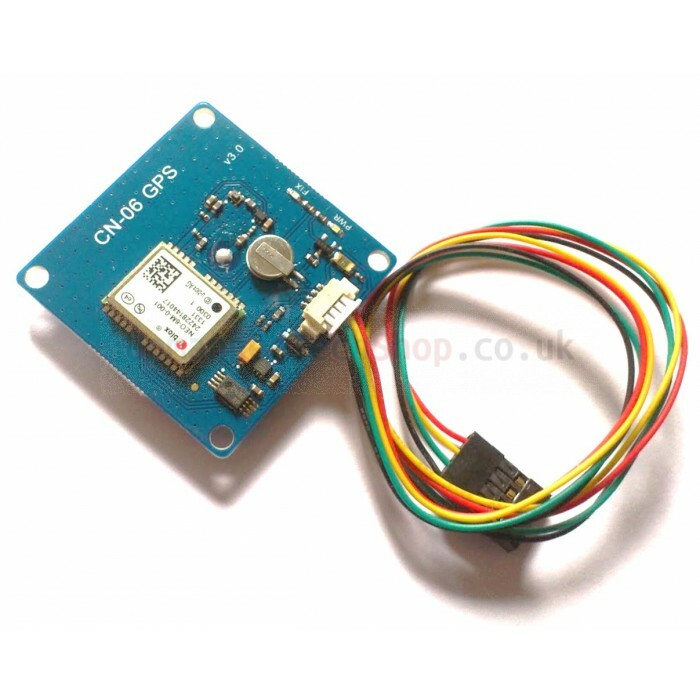 There are many tutorials and books that use these components and as the MicroView has the same functionality as the Arduino Uno, they can all be used.